The last great frontier: hair! Natural hair products that perform well on a variety of hair types are very difficult to find. 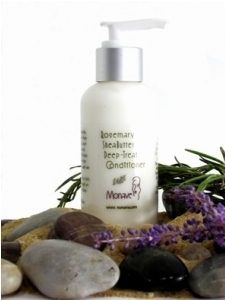 Stay tuned to see what new products Monave has in store to help you achieve soft, thick, lustrous hair! Rosemary Lavender Shampoo Ingredients: Distilled Water, Organic Aloe Vera Gel, Vegetable Glycerin, Decyl Poly Glucose, Organic Infusions of Rosemary, Rosemary Hydrosol, Seaweed Extract, Xanthan Gum and Essential Oils of Rosemary, Lavender, Thyme, Sage and Tangerine. Rosemary Lavender Conditioner Ingredients: Distilled Water, Organic Aloe Vera Gel, Vegetable Glycerin, Cetyl Alcohol, Organic Infusions of Rosemary, Rosemary Hydrosol, Organic Olive Oil, Organic Jojoba Oil, Guar Gum, Vitamin A, C, and E,(soy based), Meadowfoam Seed Oil, Seaweed Extract, and Essential Oils of Rosemary, Lavender, Thyme, Sage and Tangerine. Rosemary Deep-Treat Conditioner Ingredients: Distilled Water, Rosemary Hydrosol, Organic Sweet Almond Oil, Shea Butter, Apricot Oil, Sunbleached beeswax, Beeswax Borax, Aloe Vera, Soy Lecithin, Seaweed Extract, Xanthan Gum, Meadowfoam Seed Oil, Vitaimin E ( soy-based) and Essential Oils of Rosemary, Lavender & Chamomile. Rosemary Tonic Ingredients: Wildcrafted, Hand-distilled Rosemary Hydrosol with retained Rosemary Essential Oil. Our Rosemary is grown in the Sonoran desert and is especially potent as well as fragrant.